Nothing beats the versatility of a prefabricated fireplace. Built in Gas Fireplaces are available in a huge variety of styles and finishes, so a new fireplace installation can replace an existing unit, as part of a fireplace remodeling project, or as a completely new design feature. Many direct vent gas fireplaces come with features such as easy remote control operation, LED lighting effects and a variety of gas logs and burners to customize the appearance. Heat & Glo gas fireplaces feature heat distribution options, allowing you to control the heat in the room better, and distribute heat to other rooms, or even into your furnace to help heat your whole home. 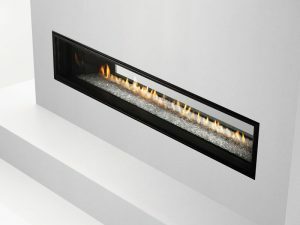 Just one of many gas fireplace innovations by Heat & Glo. For over 40 years, Top Hat has specialized in installing gas fireplaces , as well as complete remodeling, renovation and makeovers of wood, propane or natural gas fireplaces , so we can complete the entire project, start to finish. Whatever your fireplace renovation project may be, you can count on our experts to see it through! Need service or repair on gas fireplaces? Top Hat performs service and repair to all gas fireplace models and manufacturers, in the Ottawa Carleton Region. Various fireplace sales and promotions run all year long! Call today or visit one of our Fireplace Showrooms in Ottawa or Carleton Place, to see a multitude of built in gas fireplaces on display! FIRE FROM WITHIN – It’s a stunning fire. But take a closer look. An innovative burner design produces flames from within the logs. Creating depth and adding intensity. PRIMO gas fireplace; where intricate modern styling meets our exclusive innovative heating technology. See the PRIMO 72″ in Our Carleton Place Fireplace Showroom! Add flair to a classic look, highlight contemporary elements, or upgrade your space years from now, all with the SlimLine Fusion gas fireplace. LIMITED TIME SAVINGS UP TO $500.00! The most award-winning gas fireplace series ever made. Select the features you want, from the model you need. A variety of models provides flexibility to upgrade with different features. Available in several burner configurations, the Enviro C60 Linear Gas Fireplace is a spectacular focal point for large rooms.